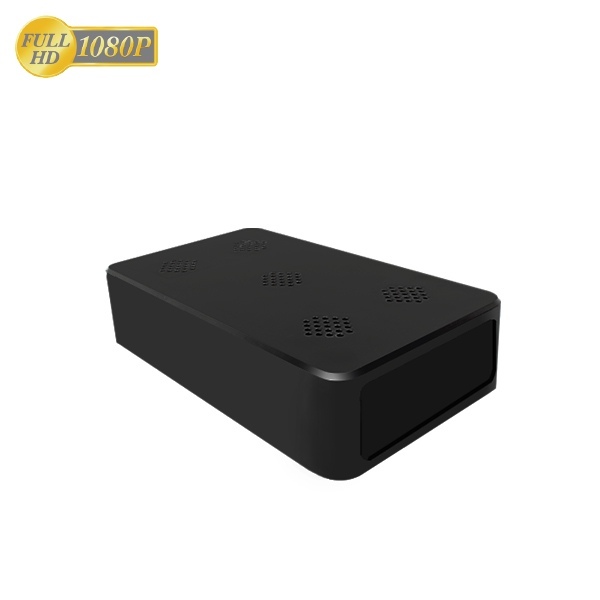 This completely wireless black box covert surveillance system holds a 5000mA battery and so can run for around 8-10 hours with no cable connections whatsoever. You can view live 1080P HD video footage from anywhere worldwide via your mobile phone or tablet thanks to the, incredibly easy to set up, WiFi functionality. 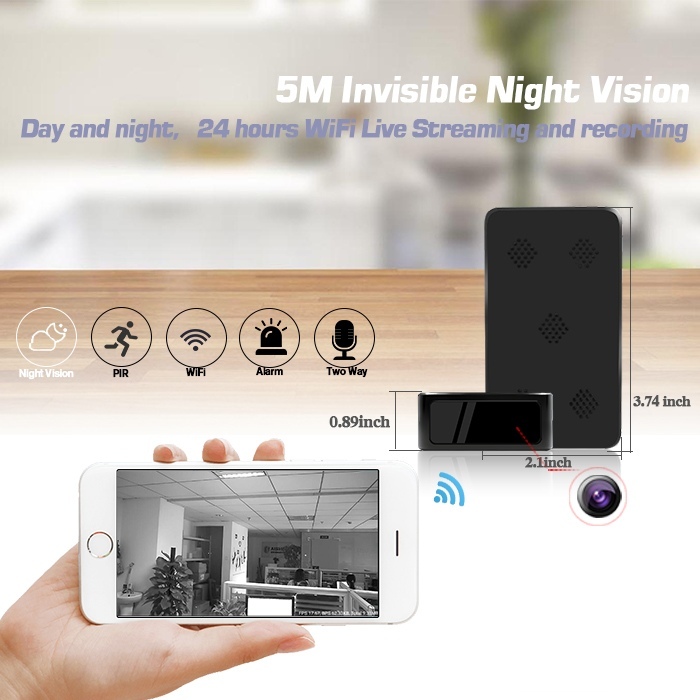 This indoor camera can be tucked away pretty much anywhere and is likely to go unnoticed in pretty much any location, perfect for placement on a book shelf or underneath something on a table or desk for example. The 2MP CMOS lens offers an angle of view of around 90 degrees and the black box WiFi camera can accept a micro SD card (not supplied) up to 128G in capacity, so plenty of recording space. 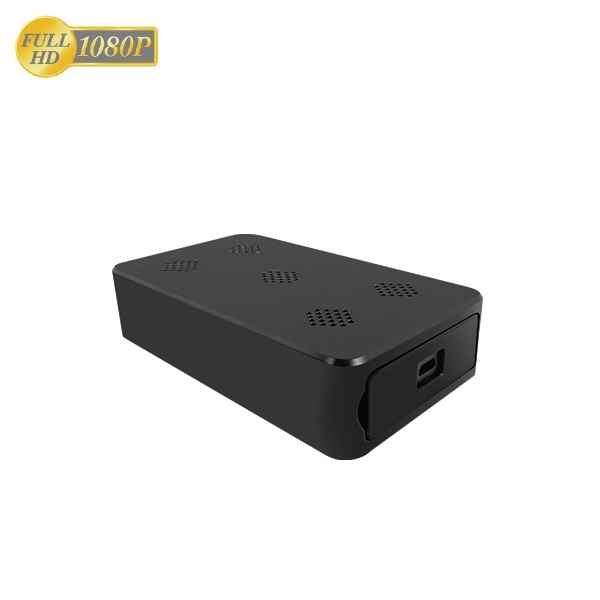 This covert surveillance device can record video at 1920 x 1080 resolution. The built in covert infrared offers night vision range of around 5m so you can even see what’s going on in dark conditions. The infrared can be turned on/off from the app or you can set a schedule so that it switches on/off at the same time every day. Is it complicated to set up the WiFi? No, it really isn’t. Just click on our WiFi Set Up tab above and it will walk you through it, it takes less than a minute! I ordered this product Black Box WiFi Covert Surveillance Camera, in the pictures it shows the lens concealed but the lens is noticeable. I sent the item back and received a full refund but Pakatak did not pay for my return postage costs. Firstly ensure you have fully charged the built in battery using the mains power adaptor and USB cable supplied. Then switch the on/off switch on the camera to the ON position. Is the video footage in colour? Yes, during the day it is. If you switch on the infrared (via the app) then the footage will change to black & white.